PCI Express is a serial expansion bus standard operating at multi-gigabit data rates. It is the third generation, high performance I/O bus which is used for interconnecting peripheral devices. PCI Express provides higher rate of data transfer and lower latency compared to the older PCI and PCI-X technologies which implemented parallel I/O bus. Each device which is connected to the motherboard via PCI Express link actually has a dedicated point-to-point connection and as it is not sharing the same bus, it doesn’t have to compete for bandwidth. PCI Express is based on the point-to-point topology where there are dedicated serial links connecting every device to the root complex. 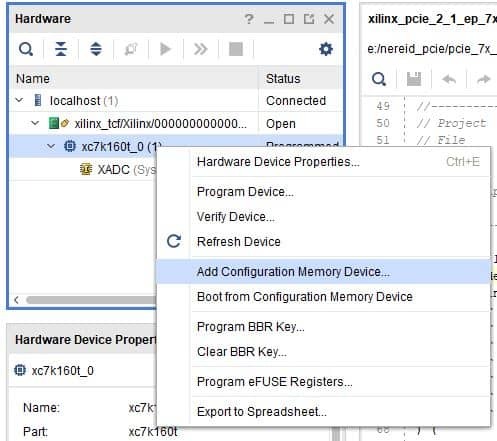 This article implements a simple design to demonstrate how to write and read data to Nereid Kintex 7 PCI Express Development Board which acts as a PCI Express endpoint device. Lets get started! 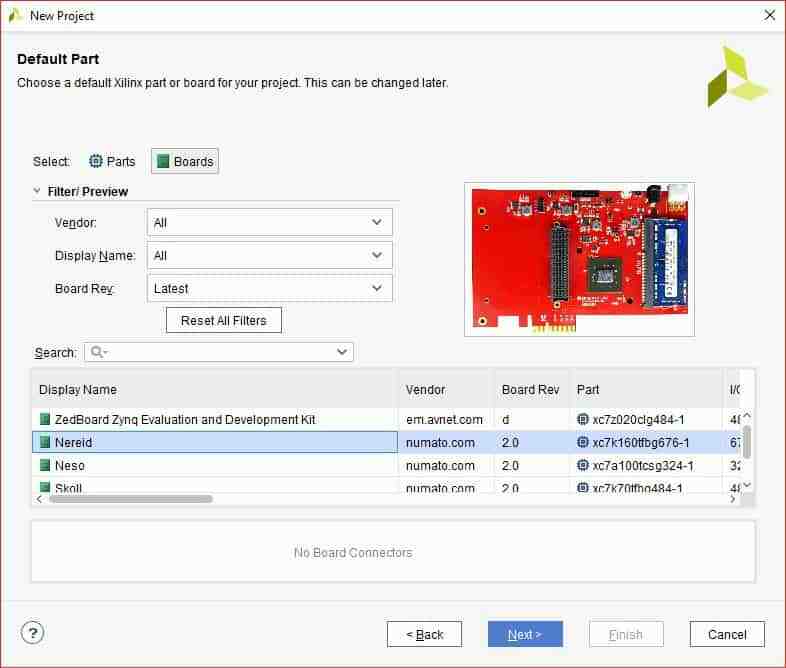 Download and install Vivado Board Support Package files for Nereid from here. Follow the README.md file on how to install Vivado Board Support Package files for Numato Lab’s boards. 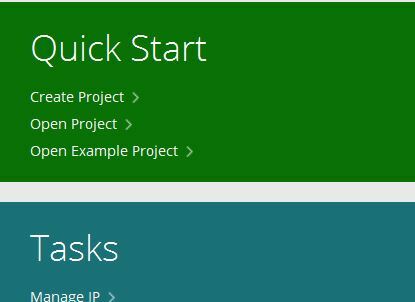 Open Vivado and select “Create Project” from the “Quick Start” section. 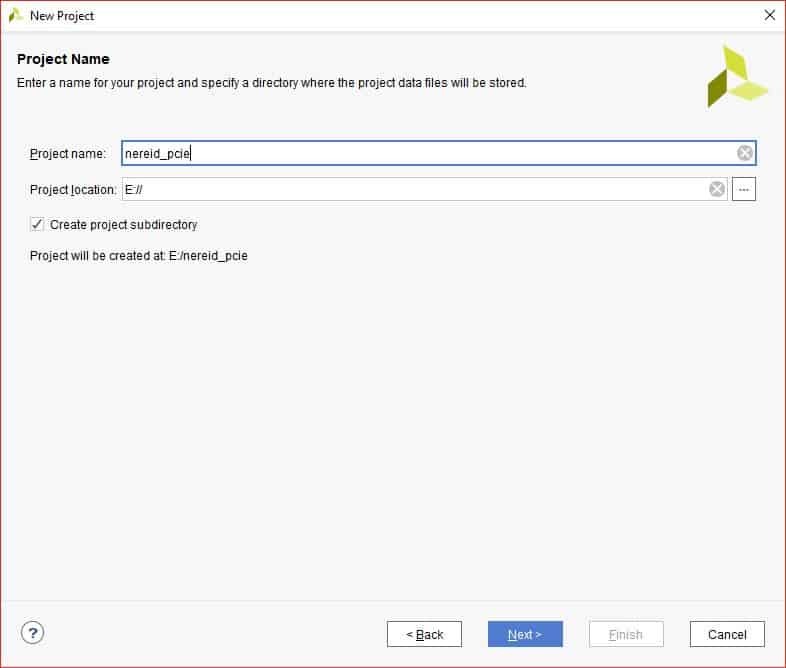 Click Next and then in Project Name tab, give appropriate project name and location and click “Next” till you see the ‘Default Part’ tab. Select “Boards” from “Default Part” tab, choose “numato.com” as Vendor. Select “Nereid” and click “Next”. If Nereid is not listed, make sure board support files are installed correctly. Click “Finish”. A new Vivado project will open with the selected settings. Click “Next” and then “Finish” to create the project. 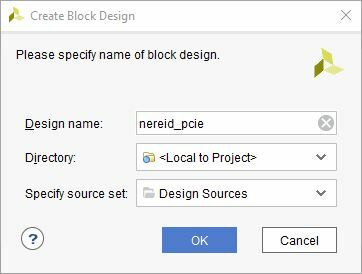 Click “Create Block Diagram” from IP integrator tab on left, give a name for block design and click OK.
Click “Add IP” from the toolbar as shown in the image below. 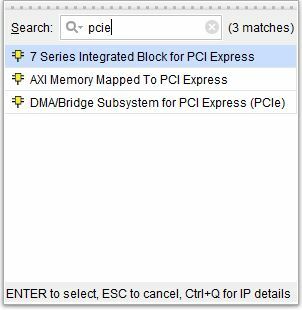 Type “pcie” in the search box and double click “7 Series Integrated Block for PCI Express” IP to customize it. The “Re-customize IP” window should open. In Basic tab, Select “Lane Width” as “X4”, “Maximum Link Speed” as “5.0 GT/s”. In “BARs” Tab, select Size Value as “512”. 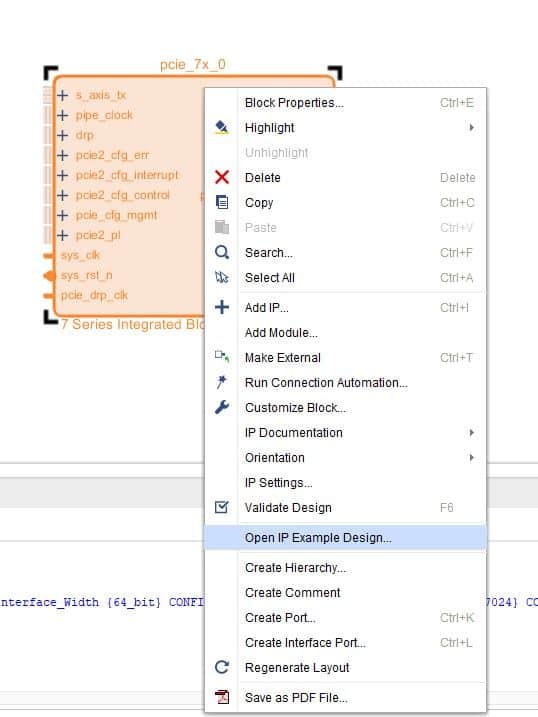 Leave the other tabs in their default state and click OK.
Right-click on the pcie_7x_0 IP block in the block diagram and click “Open Example IP design…”. 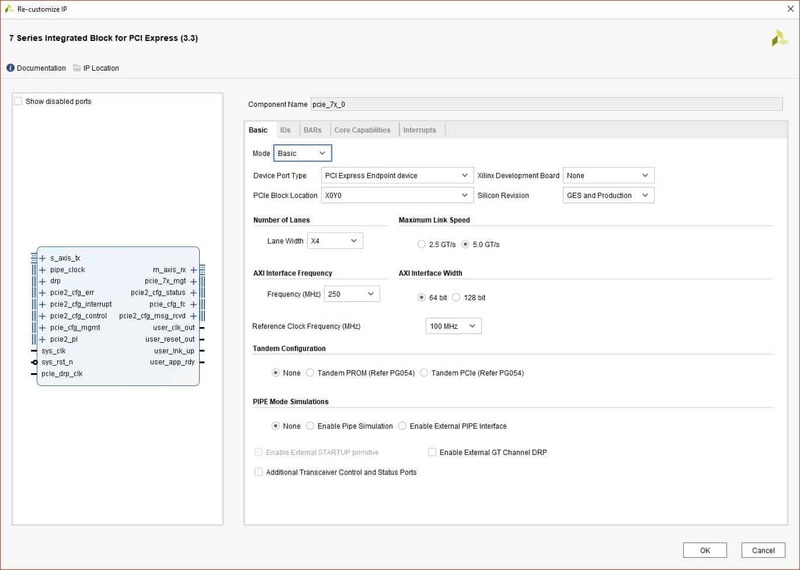 It will open an example project for the PCI Express Endpoint Device as per the customised IP settings. 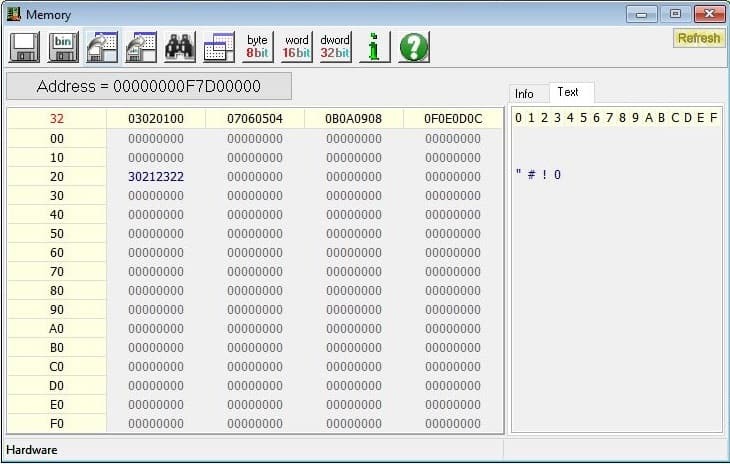 This tutorial uses this generated example project by Xilinx. It already has RTL logic enabling users to write data to FPGA and read back from it via PCI Express. Open .xdc file from “Constraints” category under Sources “Hierarchy” tab. Select everything and delete it. Simply copy the following constraints in that file. 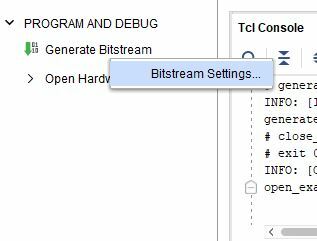 In “Bitstream Settings”, select “-bin_file” and click OK. 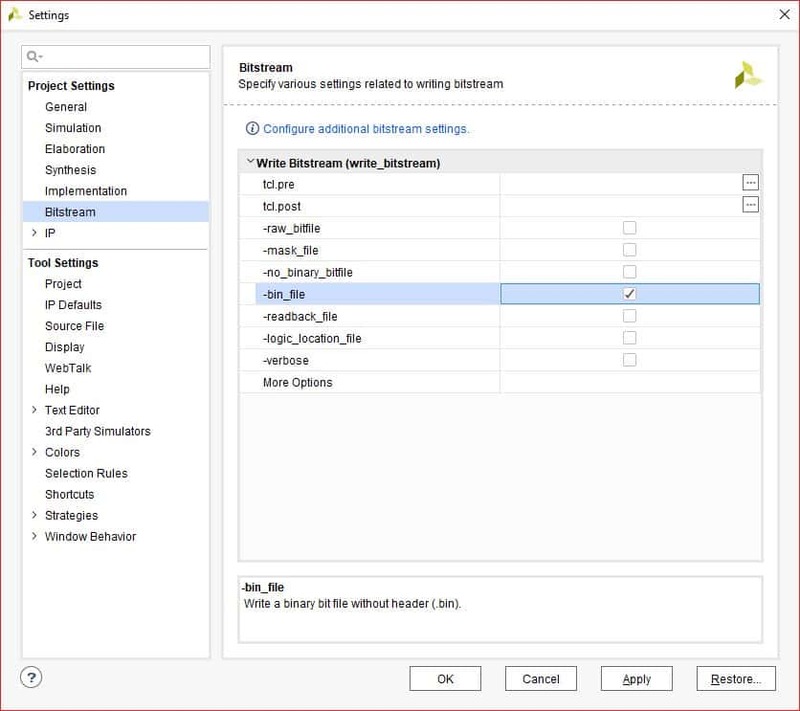 In Project Manager Tab, click “Run Synthesis”. 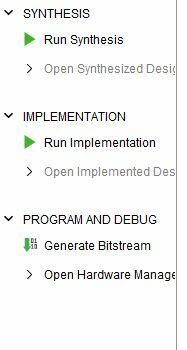 If synthesis is successful, click “Run Implementation”. 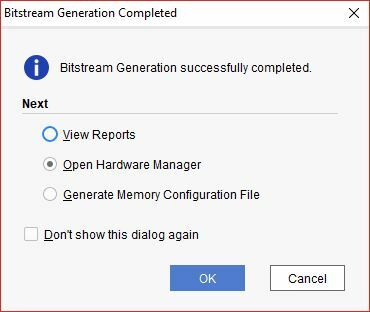 On successful completion of implementation step, select “Generate Bitstream”. Make sure Nereid Board is connected to JTAG and power supply. 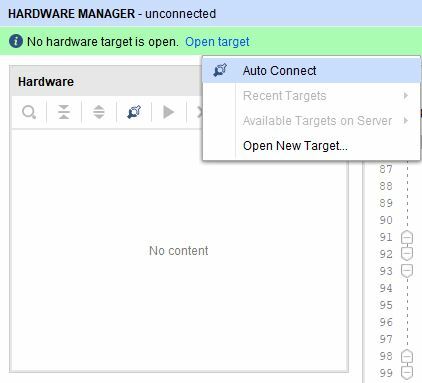 Click on ‘Open target’ and ‘Auto Connect’. Vivado Hardware Manager will connect to Nereid. 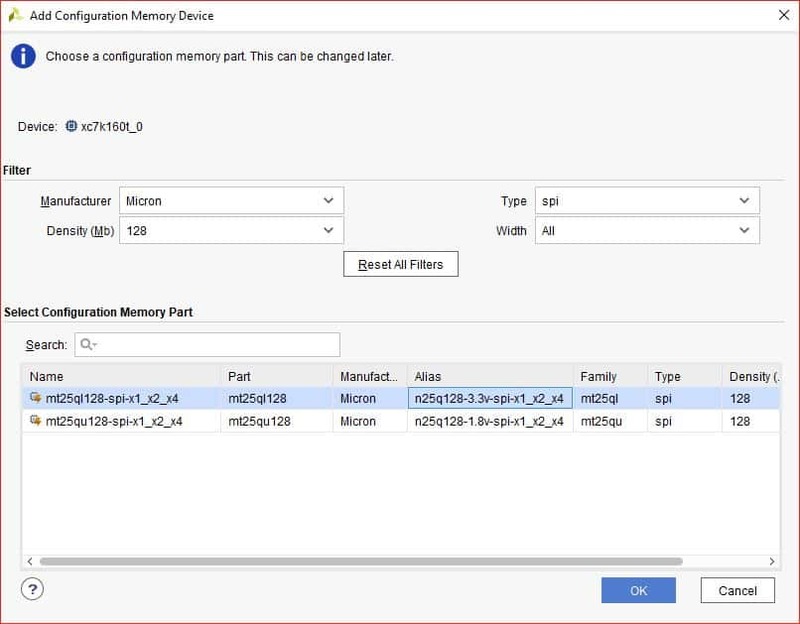 Left-click on the device and select ‘Add Configuration Memory Device…’. It will open a new window. Select Manufacturer as ‘Micron’, Density(Mb) as ‘128’ and Type as ‘spi’. Select device ‘mt25ql 128-spi-x1_x2_x4’ and click on OK.
A Dialogue window will appear asking if you want to program the configuration device now. Click Yes and program the .bin bitstream file which is located in “<project location>/ProjectName.runs/impl_1” directory. Once the device is programmed, test it on a Windows or Linux machine. lspci -vv the output of the command is shown below. Make sure the Nereid Board is inserted correctly into the PCIe Slot of host system’s motherboard. 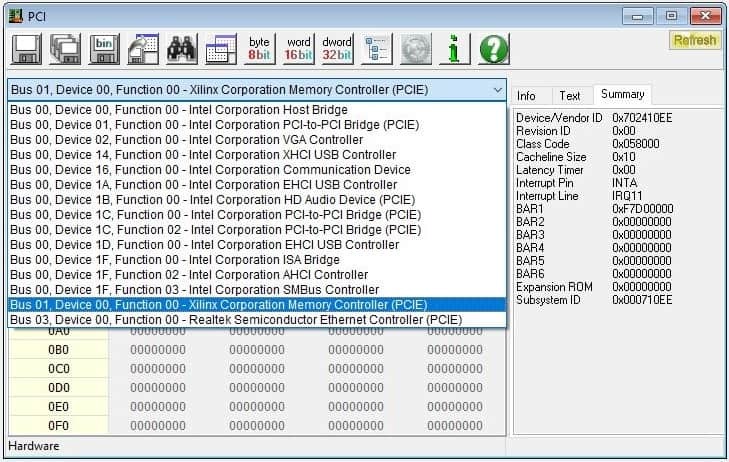 If the host is unable to detect Nereid (which should show up as “RAM memory: Xilinx Corporation” as in the image below), make sure the board is inserted correctly into PCIe Slot and do a soft-reset after the host is powered up. A soft-reset after the host is powered up helps the host detect FPGA based PCIe devices. w: indicates whether it is word, byte or half word. 0xffffff12: 32-bit data value for write purpose. You will observe the following output indicating that the 32-bit data has been written to the specified address and read back from it. If the written data matches the data read, it means data was successfully written to Nereid. 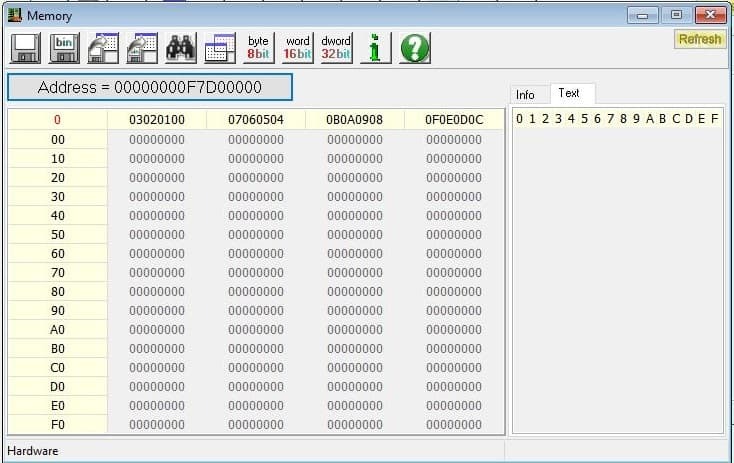 For windows machine we will use ‘RW-Everything’ software to write data. Download the software from here and install it. Insert Nereid in the PCI Express slot of the host system’s motherboard. Power up the host and then do a soft-restart again. Boot into Windows. 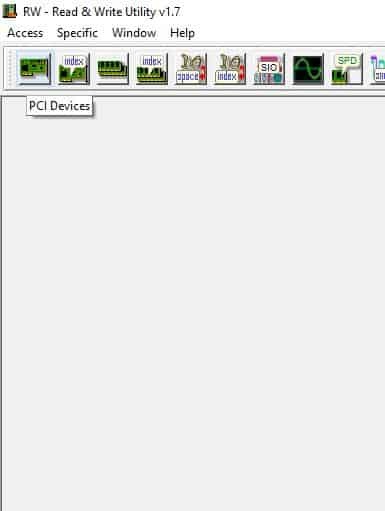 Open RW-Everything and click on “PCI Devices”. It will open PCI Devices window. 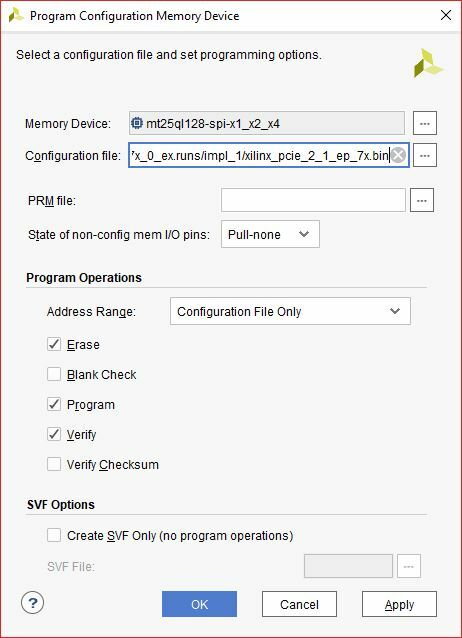 Select Xilinx PCIe Device from dropdown list. Locate the BAR Address from the addresses on the left-side. 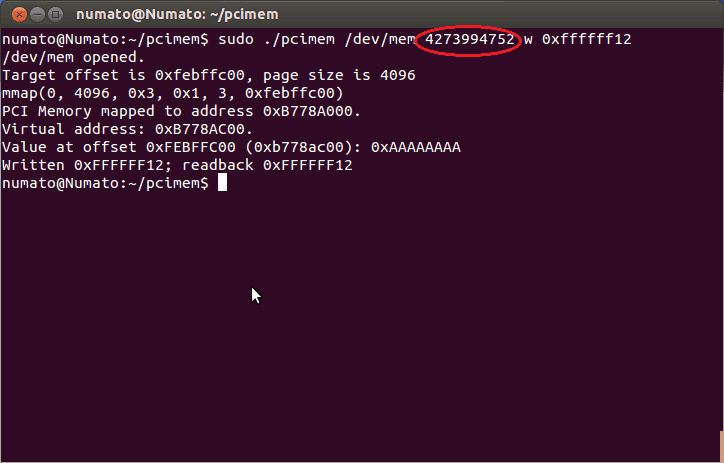 Double-click to open the BAR Address and select any one of the address memory location and write some data to it. The data is persistent on Nereid as long as it is powered up. We can verify it by closing and re-opening the application, which should show the data written previously, indicating that the write operation was successful. So, this was a basic introduction into getting started with PCI Express using Nereid Kintex 7 PCI Express FPGA Board. PCI Express offers lot more capability such as DMA transfers and bus mastering. 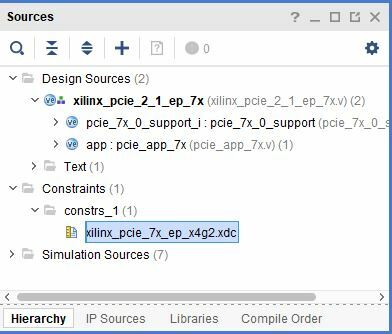 High-performance PCI Express projects will most necessarily need custom drivers for either Windows or Linux, depending on the Operating System which is to be used. 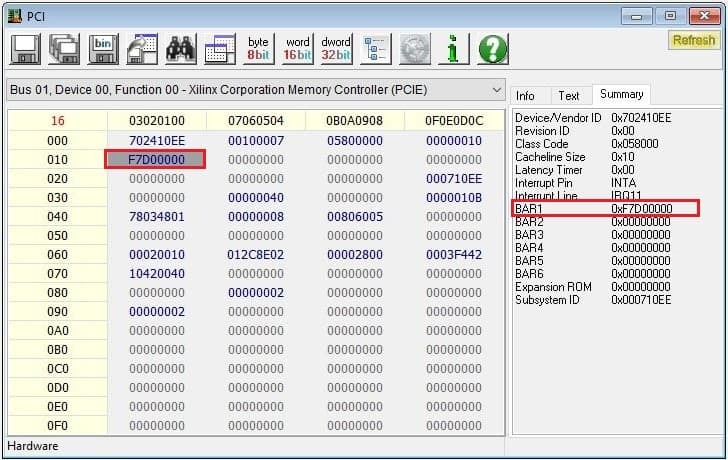 This article is just a start of the big journey into PCI Express. We encourage you to keep moving forward! am using PLX PCI 9054 custom board which is CYCLONE 3 altera board .SO, i went with quartus .for that How can i perfrom DMA and how can I do read and write ? 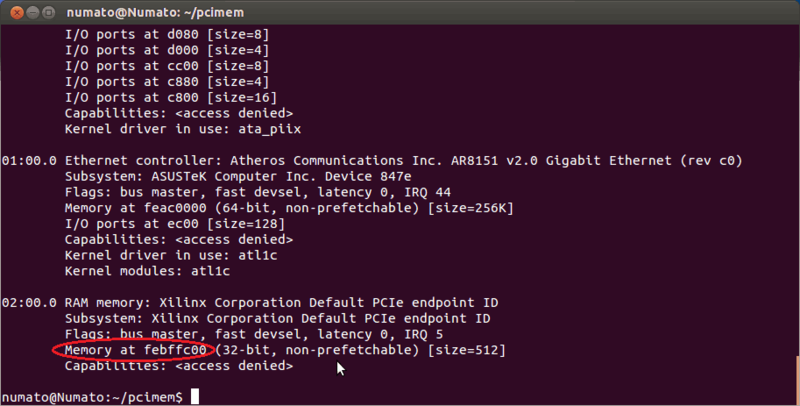 How can i getting started with PCI on ALTERA cyclone 3 FPGA board? Hi! This article doesn’t support Altera boards. Please refer to Intel/Altera documentation for using PCI Express on Cyclone FPGAs.